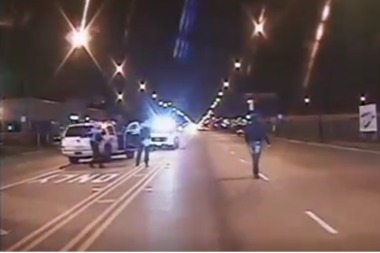 A still from the dashcam video of Laquan McDonald being shot by a police officer. CHICAGO — Chicago Police Supt. Eddie Johnson is moving to fire seven officers accused of lying about the shooting of Laquan McDonald and its aftermath. "The officers have been relieved of their police powers prior to the determination of the Police Board," Police Department spokesman Anthony Guglielmi said. As part of process, Johnson will submit his recommendations to the Chicago Police Board, which will ultimately decide whether to fire the officers. Officers in the Police Department were notified via email that Johnson will recommend the firing of seven members of the force involved in the October 2014 shooting, a source said. Thursday's email to officers came after Joe Ferguson, the city's inspector general, sent a report to Johnson recommending the firing of 10 police officers involved with the case. "The department and its outside counsel have carefully reviewed the reports and supporting documents, videos, and other evidence and will accept" the recommendations to fire seven of the officers, Guglielmi said. The firings would be based on Rule 14, a section of the Police Department's disciplinary code that concerns an officer "making a false statement, written or oral." Shortly after the Police Department received Ferguson's report, Deputy Chief David McNaughton, who signed off on a police report justifying McDonald's shooting by officer Jason Van Dyke in October 2014, announced his retirement. A lieutenant involved in the case, Anthony Wojcik, retired in May. The Police Department disagreed that a 10th officer should be fired and "feels that there is insufficient evidence to prove those respective allegations," Guglielmi said. Earlier this week, Mayor Rahm Emanuel said any changes within the Police Department were in Johnson's hands. "I appreciate Supt. Johnson's thoughtful review of the Inspector General's report, and I fully support his decisions," Emanuel said in a statement Thursday." As the city takes these important steps to hold individuals accountable, we must also recommit ourselves to partnering together to rebuild trust between our police department and our residents." Also on Thursday, Van Dyke appeared in court for a routine status hearing where Ferguson's office turned over roughly 15,000 pages of evidence. Van Dyke is next slated to appear in court Sep. 29. Erica Demarest contributed to this story.